We love new online slots game that tends to go for something a little offbeat, it’s these types of slots that separate themselves from the bog-standard fruit slots that you see cropping up here there and everywhere. 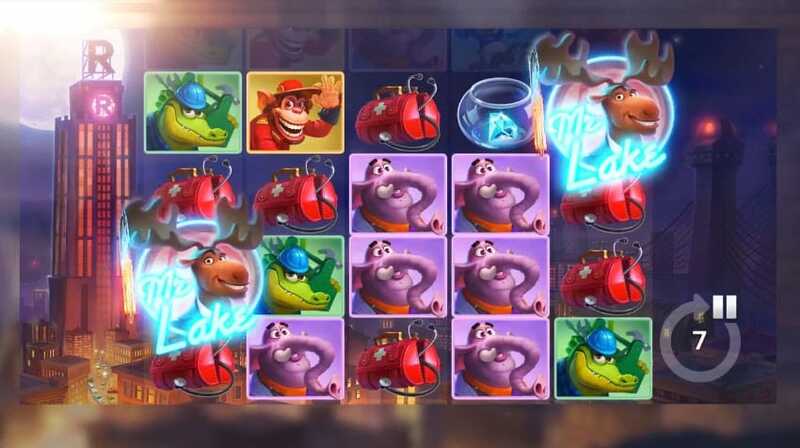 From ELK Studios, we would like to introduce you to Lakes Five, a slot that lives within its own little bubble. If any of you out there are familiar with the movie Zootopia then you might find similar footing here. This is a game centred around animals that all possess human traits and jobs. For example, one symbol here portrays a crocodile holding a toolbox wearing overalls. The only difference between Zootopia and this slot is that this is a heist-themed slot! Lakes Five is a 5 reel game that boasts over 178 different ways of winning with each and every spin. We couldn't recall having two games the same throughout the entirety of our many spins on these reels. There is quite a lot in terms of additional features here too, so try not to judge this slot based on appearance alone. Each symbol here is clearly outlined by a various colour, set about against a beautiful cityscape. This is a very pretty 3D latest online slot games that’s for sure. ELK Studios have only been around for half a decade, which in slot developer years is like a full lifetime. Based in Sweden, these guys first came into the online gaming spectrum with a slot titled Hong Kong Tower back in 2013. Since then the developer has gone on to make strides in all kinds of different themes and genres, all the while keeping the integrity of their own motto and ethos intact. We wish all online slot devs were like ELK but then again, ELK is one of a kind and who would want to blend in? If you love promo's, check our promotions at online casino today. Lakes Five is chocked full of bonus features for players to utilise in a manner of different ways. Yes, there are wilds and scatters here, and yes they work in all the ways that you’ve come to know from playing these slot games before. Wilds will substitute out certain symbols for the scatters, scatters when matched offer you the chance of earning additional multipliers to base scores. The main attraction of this slot is the heist bonus game, where one is given additional free spins from matching, even more, scatter symbols. In this heist feature, one needs only to collect golden keys via a mini-game, the more keys you have the higher your score: simple.